Lately, I’ve been making a lot more cauliflower rice. 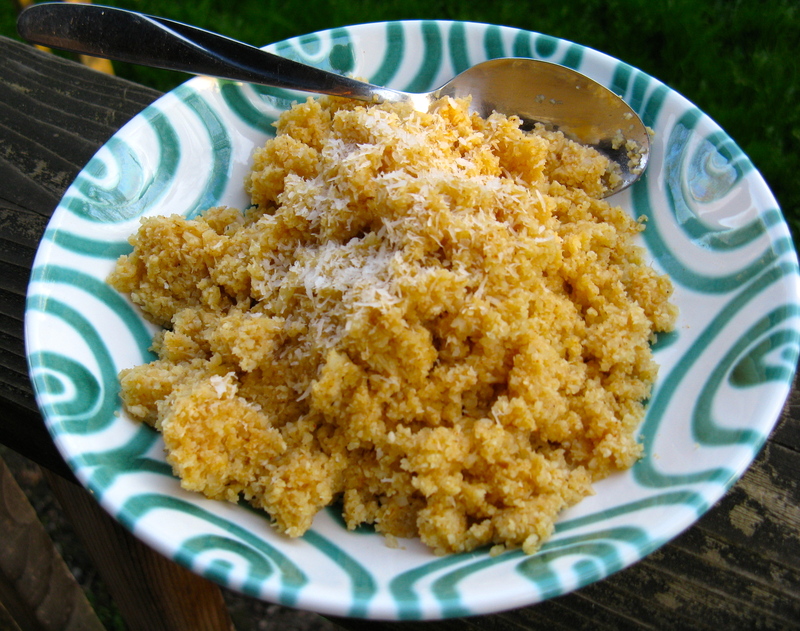 I love the versatility of it and enjoy creating different variations like I did with this red coconut cauliflower rice. This “rice” gets its red color from paprika and cayenne, and is cooked with unsweetened coconut flakes and coconut oil. It’s delicious! I think I’m also making more cauliflower rice because I got a bigger and better food processor that makes prep a breeze. Before, I was using a tiny 4-cup prep food processor and had to rice cauliflower in multiple batches, which took a fair amount of time. It didn’t come as a big surprise when the motor in that little guy crapped out. I always pushed its limits and take full credit for its death. On the bright side, I got my money back, even after having it for over a year. And, now, my 11-cup Cuisinart rices the crap out of cauliflower! Toss chopped cauliflower pieces into the food processor. Pulse several times until cauliflower is riced. Melt coconut oil in a large skillet over medium heat. Add the riced cauliflower and season to taste with sea salt and pepper. Cook for a couple minutes. Then, add the cayenne and paprika, and stir. Continue to cook for a few more minutes over medium-low heat. Adjust seasonings if need be. I feel like that about blogging, as well! I’m back in the saddle after only doing a few posts a months for 5 months! Yes, blogging DOES get hard. I’m always disappointed when a recipe fails, of course, but now there’s the added pressure of not being able to post it! It’s so good to know I’m not the only one! Yes, recipe fails are a bummer, especially when I have nothing in the archives to pull from! Also, I wish there was such a thing in nature as “red coconut”. Ha, me too! I thought the exact same thing when I wrote this post. Alisa — I feel like I could have writen this post. We are so on the same page! First, on blogging: Sometimes, I get tired of my own thoughts and it’s hard to motive to write them down. Getting started can be hard, but I am always pleased when I am done. 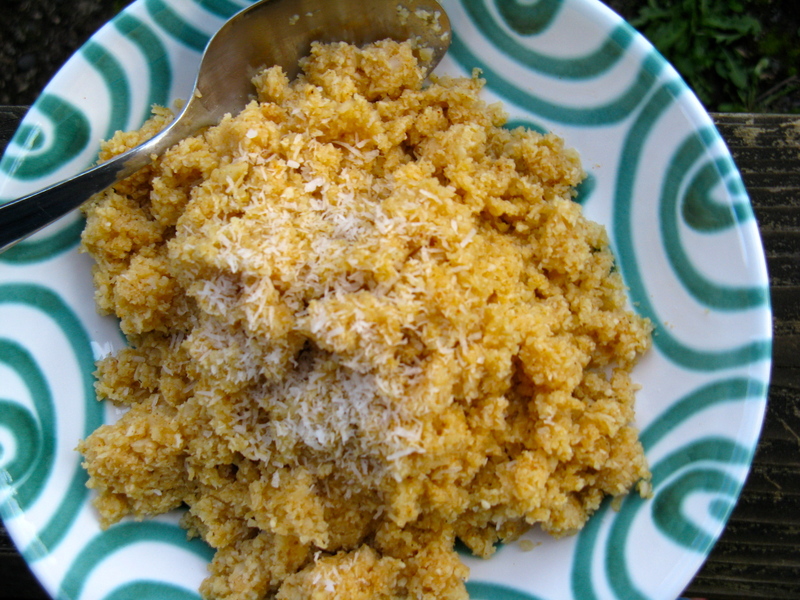 Second, on the food processor: I have never been as into cauliflower rice as many paleo folks. Your post made me realize that it was probably because I had a 4 quart blender, which makes pureeing a head of cauliflower sort of messy and time-consuming. My little blender recently stopped working and I haven’t bought a new one. Thanks to your post, I will make sure the next one I buy is bigger! It sounds so much easier! Amen, Mary Catherine! It’s nice hearing from others who feel the same way. Whew, I’m really not the only one (didn’t really think I was alone in this though). A bigger food processor makes all the difference. I rarely ever made it before with my little one…too much time and work! Now, it’s a piece of cake and I get so much satisfaction out of ricing my cauliflower so fast! It wows me every time, at least right now. Thanks for sharing. I appreciate your words! Try this… Fill your bender up with small chucks of raw cauliflower, then add water almost to the top of the bender. Leaving enough room for the lid. Then blend the cauliflower to the size you desire. It will blend to the size of couscous quickly! Experiment with the time blending to achieve the size of cauliflower you desire. Then drain the blended cauliflower and use in your recipe. I love cauliflower and have so many recipes for it I could do an entire Paleo food blog for it! @Alisa-Thanks for the Red Coconut Rice recipe. Making this today for dinner. BTW… You’re awesome! Aw, thanks Kem! You’re so sweet!